A pattern that applies only to containers (notes & agents), is plot(). It evaluates an expression using data from each child of the containers to produce a graph; i.e the scope is always a group, specifically 'child'. The graph, in the forms of a sparkline-type plot is drawn across the viewport area of the container. The graph is drawn in colour $PlotColor. The container viewport is still accessible for drag/drop, etc., as if the plot weren't there - think of the plot as an overlay. An alternate plot type is bargraph(), which draws a bar graph of each child item's value. The ring() plot displays an arc representing 70% of a complete circle. The circle is always drawn centred on a 9-o'clock position; a 50% completion would fill from 6 through 9 to 12.
the plot graphs the data from a baseline of 10 to a maximum value of 900. Values outside these are plotted appropriately as the min or max values. 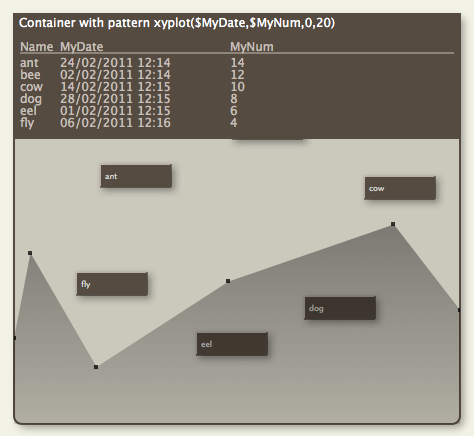 The plot/bargraph patterns are ignored if applied to non-container notes. A container can also apply the bar & vbar progress bar patterns as used with note icons. However, as both types of visualisation use the $Pattern attribute it is not possible to use a progress bar and plot at the same time. Where a container plot is applied, Before the graph is drawn, the space behind the plot is filled with the colour $PlotBackgroundColor with opacity of $PlotBackgroundOpacity. Previously the background was that of the child map.